Eighteen masterful fairy tales for adults from a remarkable gathering of contemporary Grimms and Andersens, the new princesses and princes of fantastical fictionWorld Fantasy Awardâ€“winning editors Ellen Datlow and Terri Windling return with another superb collection of wonders and terrors.... read more InÂ Black Thorn, White Rose, the magical tales we were told at bedtime have been upended, turned inside out, reshaped, and given a keen, distinctly adult edge by eighteen of the most acclaimed storytellers ever to reinvent a fairy tale. 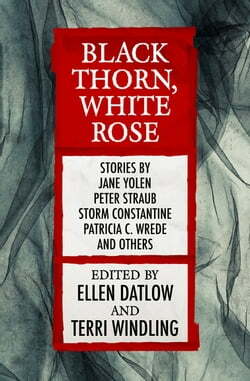 Our favorite characters, from Sleeping Beauty to Rumpelstiltskin to the Gingerbread Man, are here but in different guises, brought to new life by such masters as Nancy Kress, Jane Yolen, Storm Constantine, and the late, great Roger Zelazny.These breathtaking tales of dark enchantments range from the tragic and poignant to the humorous to the horrifying to the simply astonishing. The story of an aging woodcutter persuaded to help a desperate prince make his way through the brambles to save a sleeping beauty twists ingeniously around like the thorny wall that impedes them. The fable of an all-controlling queen mother who faces her most fearsome adversary in a sensitive princess who appears mysteriously during a storm is a dark, disturbing masterpiece. And readers will long remember the exquisite tale of Death, his godson, football, and MTV.Anyone who has ever loved or even feared the old tales of witches and trolls and remarkable transformations will find much to admire in this extraordinary collectionâ€”happily ever after or not.